Karma nibbled at the sleeve of his undershirt, then followed his arm around behind him and found the metal bracelet encircling his wrist. This was something she knew about. Leon smiled as he felt her lips investigating the handcuffs, and then her warm breath and soft tongue moistened his hands. He knew there was nothing she could do to free him this time, but she sure was trying. ​This follow-up to ICE is everything I hoped it would be. It is both harrowing and heartbreaking. Life changing events occur during a reunion with the Marsham family. As hard as it is, they stay true to their word to see things thru to the end, whatever that may be. Very much looking forward to part two. 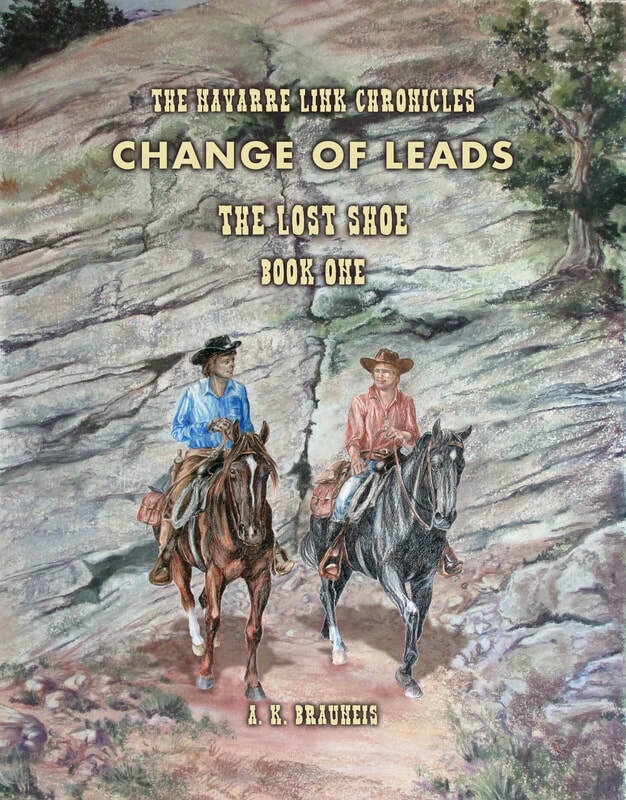 The Navarre Link Chronicles is now available in Kindle and paperback on Amazon.com. If you would like a signed copy, please let me know. THIS IS WHEN THE STORY REALLY BEGINS! "​I JUST FINISHED THE BOOK AND I AM READY FOR THE NEXT! SEVERAL PARTS CRACKED ME UP ESPECIALLY WITH KARMA, I HAVE KNOWN MARES LIKE HER." "CINCH UP YOUR SADDLE FOR THIS WESTERN ADVENTURE! 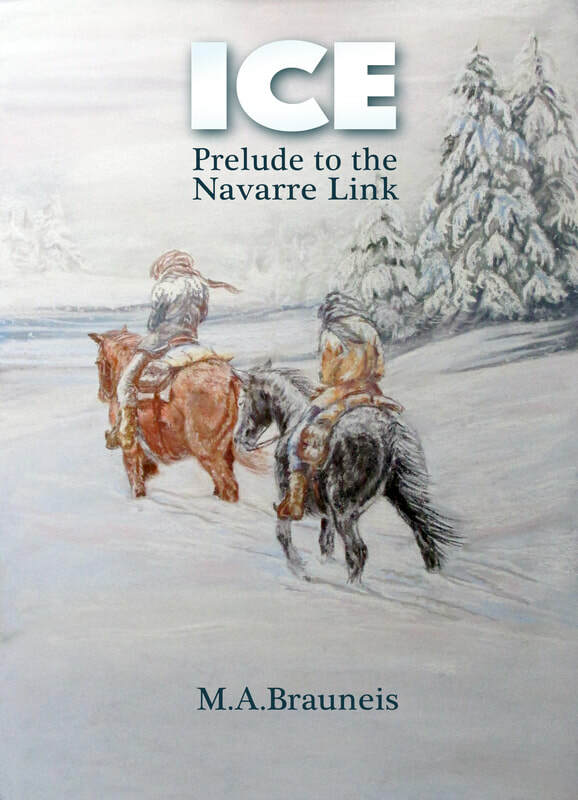 ICE: PRELUDE TO THE NAVARRE LINK , BY M.A. BRAUNEIS WILL KEEP YOU IN SUSPENSE FROM BEGINNING TO END. NAPOLEON NASH AND HIS NEPHEW SIDE-KICK JACKSON KIEFER ARE ON THE RUN FROM THE LAW. THE FREEZING WEATHER WORKS AGAINST THEM AS THE POSSE NEARS. 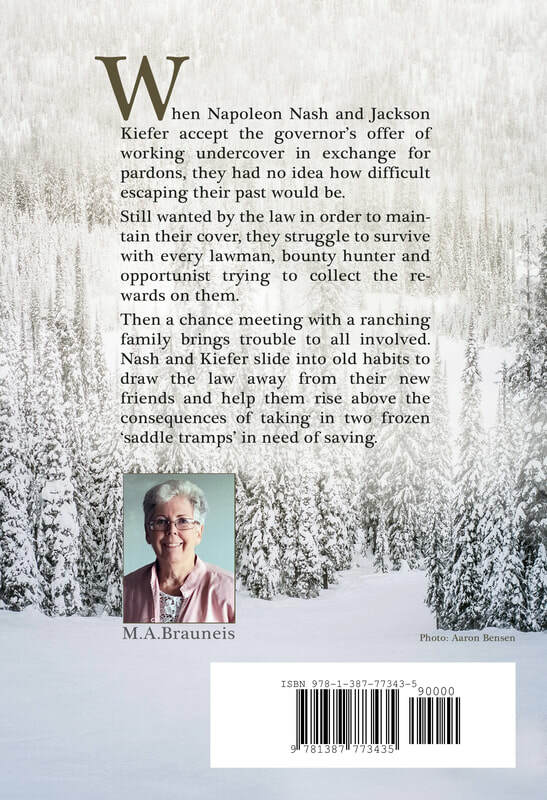 WYOMING WINTERS ARE NOTORIOUS AND THIS ONE IS NO EXCEPTION. IT’S DECEMBER, 1882 AND HOPE IS RUNNING OUT– WINTER WON’T LET UP FOR MONTHS. NEVER MIND THAT NAPOLEON AND JACKSON ARE WORKING UNDERCOVER IN EXCHANGE FOR PARDONS—THE RELENTLESS POSSE ON THEIR HEELS DOESN’T KNOW THAT. THE MEN FOLLOW THE SMELL OF WOOD SMOKE AND FIND SHELTER WITH A WELCOMING RANCH FAMILY. THE KINDNESS OF STRANGERS SAVES THE TWO FROM THE FREEZING WEATHER, OR WORSE, A DETERMINED POSSE. AS THE STORY PROGRESSES, THE TWO PARTNERS CONTINUE WITH THEIR DRIVE FOR FREEDOM. 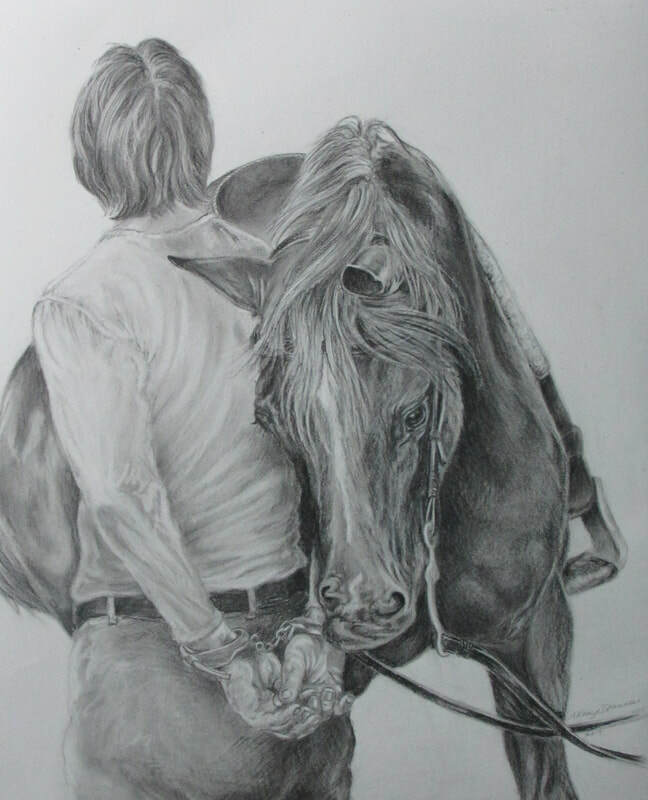 IT’S A STORY RICH IN WESTERN LORE WITH IN-DEPTH SCENES AND CUSTOMS OF THE PERIOD, THE LOVE AND NECESSITY OF A GOOD HORSE, AND THE COMPANIONSHIP OF TWO MEN WHO TRY TO BALANCE LAW AND SURVIVAL. ICE ENTICES THE READER TO LOOK FORWARD TO THE NEXT ADVENTURE OF NAPOLEON NASH AND JACKSON KIEFER. IT’S WESTERN ADVENTURE AT ITS FINEST". COMING SOON! 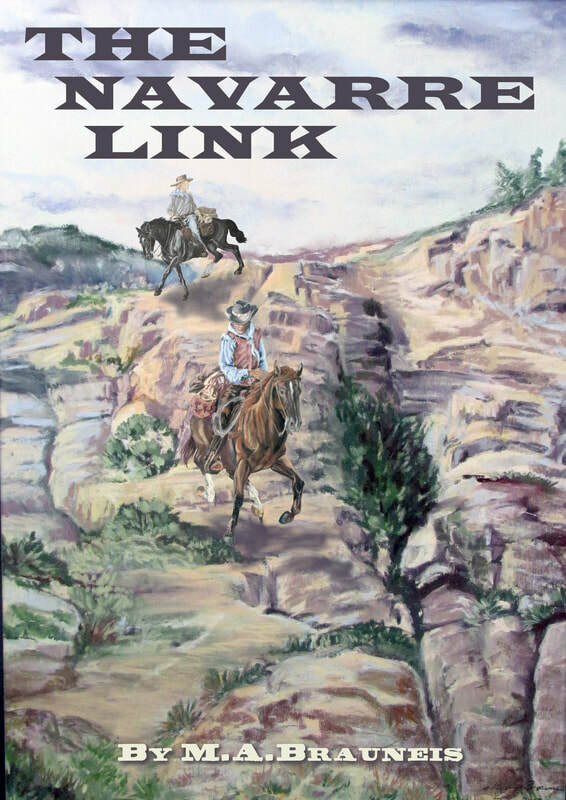 The Navarre Link, Book one: Twisted Fate, Volume one: They Rode Together. Yes! You guessed it! This is an epic tale of redemption. How the loyalty of friends and the love of family can keep you going through the worst that life can throw at you even wen you have given up! Be forewarned! This is an on-going series. Once you start, you will be hooked! 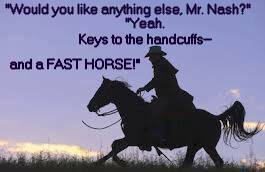 Writing has always been important in my life and recently I have been working on a series of Wild West novels. ​My first sojourn into self-publishing is now available through LuLu! This has been quite a learning curve, and a good trial-run in preparation of my epic! I hope you all enjoy this little snippet! ​The novella, titled Ice is a preclude to the The Navarre Link. Some of you will recognize this story, but it will be entirely new to others. This will help to fill in some of the blanks. I am working on making a download of ICE, in PDF available shortly. Well, here I am, getting ready to publish my first book. ​I think it is fair to say that I have been preparing to write this story since I was fourteen years old, as this was when my heart was broken for the first time. I have always loved Westerns: movies, TV series, books, lifestyle. I'm still a cowgirl at heart, fully decked out in my cowboy hat, chaps, tall boots and spurs, whenever I hit the trails with my horse, Monty. And no, I rarely use the spurs unless he is being particularly inattentive; they really are mostly for show! Anyway, yes I've always loved Westerns. High Chaparral, Lancer, Wagon Train, Wanted Dead or Alive, I was glued to the screen and couldn't get enough. Then, in January 1971, Alias Smith and Jones hit the airwaves, and my life was about to changed forever! I don't remember when, exactly, it happened, but long before the 90 minute pilot was over, I had been hit hard by my first teenage crush. To my young eyes and heart, Peter Duel (Deuel) was perfect! Nobody else even came close. It was a year of bliss and excitement. I never missed an episode, and Hannibal Heyes, the outlaw trying to go straight, became my creative inspiration that has never been equaled. I was drawing and painting constantly, and my western theme art was improving in leaps and bounds. I tried my hand at writing western stories and found another creative outlet that has come and gone, and then come back again. It was a perfect year. Then heart break. On December 31st, 1971, to the shock and dismay of his family, friends, and fans around the world, Peter Deuel tragically took his own life. ​ Jump forward forty years, and Peter is still very much a part of my creative inspiration. Now, through contact with people who had known Peter, and through Paul Green's well researched and informative biography, first and second editions, I came to have a better understanding of the man that Peter was, and the demons he had been fighting. Five years ago, I decided to write my first full-length novel, combining what I knew about Peter, the man, with Hannibal Heyes, the character he had brought to life on the screen. It's an exploration, as such. A journey down a difficult road that upholds the importance of friendship and loyalty. About choices made, and why, and how acknowledging and accepting the choices that we make is the only way to over-come the negative and grow beyond it. It's also an exploration of suicide. I have experienced the effect of this tragic choice more than once throughout my life. I have even considered it as an option for myself, but fortunately, was able to step back from that abyss and hang on to what I had. But there are many others who go the other way. Desperate depression, leading to suicide is the hidden disease. Nobody wants to talk about it, nobody wants to acknowledge it, and yet, it runs rampant through all societies. What is it that drives a person to make such a cruel choice? How does someone go from being happy, outgoing and with an optimistic view to the future, to deciding that life isn't worth the effort anymore? What happens to the people left behind? How does the choice of just one person effect the lives of all those friends and family members who are left, having to deal with enduring loss and heartbreak? These are some of the question I explore in what turned out to be an epic tale. Once I started writing it, I couldn't stop. It possessed me. I wasn't the one writing the story, the story wrote itself, and brought me along for the ride. It was a whirlwind of typing that lasted for two years, and I sure did learn a lot about Wyoming history along the way! Now, after more time of re-writing, fine tuning and intense editing, the first volume is ready for publishing. The only thing holding it back now, is the completion of the cover design. I must be a glutton for punishment; I couldn't simply use a free image for my cover--no, I had to insist on creating it myself! See my artist's blog for more details on how that is coming along. ​So, stay tuned. I will keep everyone up to date on how things are progressing. It's been an amazing ride, so far, and it's sure not over yet!